We have been successfully manufacturing, exporting & supplying all types of Coating Machine since last 25 years from Ahmedabad, Gujarat, India. We are winner of 3 times National Award and 2 times International Award for Quality manufacturing. For Coating Machine, we have processed all types of material like Polyester, BOPP, LD, Aluminum Foil, PVC, Paper, Film, etc. We have more than 75 installations of Coating Machine in India and overseas like Saudi Arabia, UAE, Dubai, Sharjah, South Africa, Nigeria, Ghana, Congo, Kenya, Zambia, Sri Lanka, Bangladesh, Malaysia, Pakistan, Nepal, Russia, Thailand, Indonesia, Brazil, Colombia, Venezuela, Argentina, Mexico, Canada, etc. High-quality Coating Machine available with different types of range. 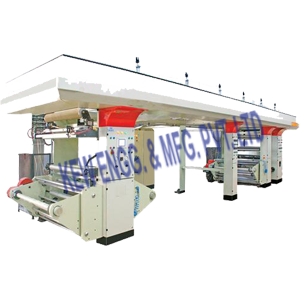 Also manufacturer of Rotogravure Printing Machine and Slitter Rewinder Machine Manufacturer. Salient Features: Coating Pan is engineered to the perfection from SS 304 (SS 316 optional). Totally enclosed machine drive and hot air blowing system. 30”, 36”, 42” or 48” Coating Machine has variable speed drive. Hot air blowing system is separate. 60” or 72” Coating Machine has two speeds with step pulley without hota i r b lowing system. Hot air blowing system is with temperature control probe.